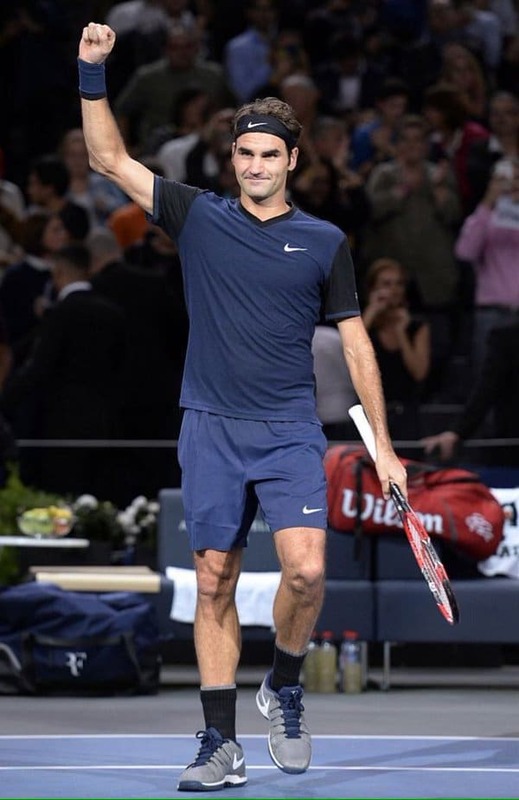 Normal match reports can now resume and it couldn't be an easier one to start with as Federer just destroyed Seppi 6-1 6-1 in 47 minutes at the Paris Masters in Bercy. It was an absolute demolition job from start to finish as the Swiss converted 5 of his 6 break points and dropped just 9 points on serve to setup a tie in the last 16 against John Isner. 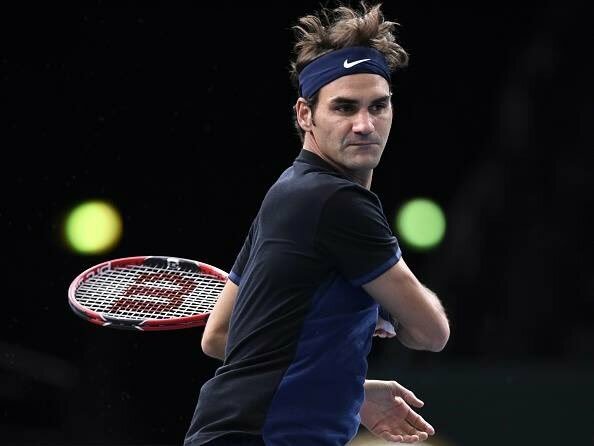 Federer won the toss and elected to receive breaking to 30 thanks to a perfect run around the backhand inside out return. The break was quickly consolidated to 15 and Roger then moved up a double break. A hold to love followed for 4-0 before Seppi got his first game on the board. Another love hold put Roger 5-1 up and the Swiss broke for the third time, hitting a sweet dropshot then a ridiculous lob on set point to seal it 6-1. Into set 2 and Roger immediately slipped to 0-40, a bit out of the blue but he saved them in style to hold for 1-0 and the broke to lead 2-0. 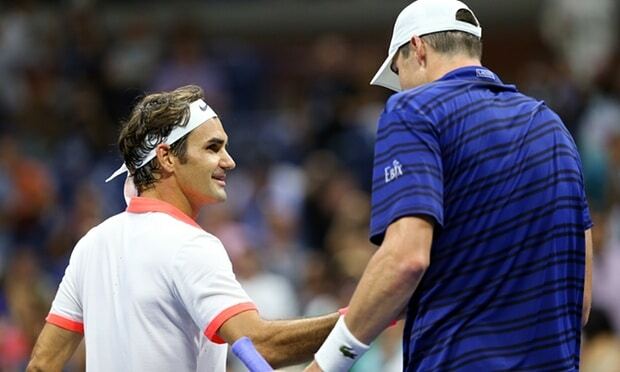 2 SABR's in game 4, one followed by an awesome rally, saw Federer break again for 4-0 and despite Seppi avoiding the bagel with a hold for 1-5 Fed served it out nonchalantly to record victory in just 47 minutes. Not quite as quick as his win vs. Golovanov in Moscow one time but still pretty impressive. Well talk about starting off Bercy with a bang and it looks like Fed is on a high from Basel as he completely destroyed Seppi. I mean it was almost embarrassing for the Italian out there as Roger just schooled him in all areas. Basically 47 minutes of every shot coming good and Seppi looking out of ideas. It is probably the Seppi's worst surface though so a win for him was unlikely but to lose 6-1 6-1 when you're 28 in the world isn't great 😆 . As for Fed he was just in untouchable mode and whilst slower courts aren't ideal for him against the real top drawer grinders, against someone like Seppi he can just setup the points exactly how he wants them to play it and control things. In fact the match reminded me a bit of when he schooled Simon in Rome 2013. All about working the angles for Fed on these types of surfaces and there is only really Murray who comes close to him in terms of understanding the geometry of the court. Next up is Isner who beat product of Roehampton and LTA wonderkid Alijaz Bedene in two sets. Fed leads the H2H 5-1 and played a great match vs. Isner 2 months ago at the US Open. A court like Paris should be good for Isner especially with his top spin serve so it could be a tough one depending on how well Isner actually plays – when he serves well and gets his forehand going he can be very dangerous but this late in the year he tends to be physically not the best and the fact Bedene took him to a tiebreak makes me think Fed will just have too much for him and get enough balls in play to fashion breaks of serve. I'll pick Fed in three sets 6-4 6-7(5) 6-2. Absolute schooling from Fed to get it done in just 47 minutes. But today was a great match 🙂 peRFect from start to finish! Can you get tickets for any other days in Paris? Real amazing play from the Fed! Can’t wait to watch the replay tonight. Won’t this surface slow down Isner’s serve? Yes but his kick serve is a huge weapon. Not much on YouTube unfortunately, the whole match is a highlight reel. Yeah looks slow, apparently it’s the exact same as London. So could be a slowwww WTF. Wow Jonathan, super sharp and quick recap, just like Fed was in God-mood this evening. “All about working the angles for Fed on these types of surfaces and there is only really Murray who comes close to him in terms of understanding the geometry of the court.” – agree! It was ecstatic, such a fun watching! One match at a time, but I can’t help but excite. Yeah could be a Big 4 semi final lineup if they all keep up the form. Nadal looking good, Djoker too and Murray just destroyed Goffin. Maybe can Stan can factor too. About the match, I can’t believe this is the same Andreas Seppi that broke my heart earlier this year in RLA. Yeah Fed world’s apart from that performance in AO. Huge upset when you think about it, just a bad day at the office. Tired of hearing/reading Fed being asked about retirement but always lovely to watch his interview. “What a hero” as one of journalist said of him. Here’s an in-depth interview made for Rotterdam Indoor, enjoy! Digging up some great stuff, Wanda! Great long interview/program. Don’t see too many of those with Roger these days. Thanks for the share. I watched it live on NOS.nl when it was broadcast the other week. Will have been a big driver of ticket sales no doubt. Wow, even on my low-res monitor one of those balls looked really mangled. How much grit can they have put in this surface?! Sounds (and looks) like an amazing performance by Fed, but I expect Isner to be rather tougher. Although … does look as though Bedene pushed him quite hard. I am getting confused at what I am watching. I thought Paris already has one clay court tournament. Not sure if you know this, but they are doing it in lieu of the Mardid blue clay Masters. How nice of the French, giving you a clay feel, smack in the middle of the indoor season. @Alison – I thought Bedene had pushed Isner hard too, but I looked at stats now, Isner won easily. Hello everyone. Been a while since I have been surfing on this blog. I watched Federer play last night after nearly 2 months, got a bit excited when I heard he beat Rafa in a Final! And those 47 mins were truly high quality from Federer, arguably his match of the year. One of the reasons why Federer defying age which I believe gives him the upper hand over his rivals is his playing style. A 85-90% Roger Federer day is a trauma for his opponents (not that I disagree woth Jonathan on this performance, but Federer can play even better). Federer was leading 4-0 first set in 9 mins. INSANE. I simply dont understand paris indoors,it looks too slow or is it the weird camera angles! Sid, Jonathan a little help on this please. Isner will be a stiff test though. I think Federer might sneak attack past him in two tie breakers! I’m yet to see a TV broadcast captured with the right focal length… well, in Cincinnati it was quite good actually. 2) Or they put it right above the baseline, use a low focal length to capture the whole court, and then make it look like a 100 m long funnel. And I’m not even talking about the dreadful camera height used on some stadiums; I certainly do not like to watch a match as if I were a pigeon sitting on the roof. I think it is a combination Addey – it’s a slow court and the camera angle makes things look even worse. Isner’s top spin serve is really good though. It should work well on this surface and he has played well on some of the slower hard courts on tour. This was really a disgraceful third set tiebreak by Roger. His typical shotmaking arrogance led him to muff that easy, high backhand volley at 1-1 (which he could’ve let bounce and done anything he wanted with), and also to dump that basic passing shot right into the net to get the mini break back. He played like an idiot for the first 2/3 of the tiebreak. It’s matches like these that make it so frustrating to be a Fed fan. Isner is a nobody with a big serve who’s sure to lose the next round. All Fed had to do was not be careless, and he couldn’t even do that. Terrible. it is called showboating. boring match! I agree, the match was dull, the courts are glacial, and I’m not saying that Fed was going to win this tourney, or even this match. But what a way to guarantee from the very beginning of the final set tiebreak that you’re virtually not going to make it. There was just one point between them, and that was the last point. You are not the one facing those bombs, and if he did have a virus (he took a couple of pills during a break), that’s not going to help. It’s always a crap-shoot against these big servers. Djokovic dropped his serve 5 time (at least) against Gilles Simon: how do you think he may have fared? Yes, perhaps if he was indeed sick, maybe that affected those ridiculous errors, including the big ones on his break opportunities in the third. I’m just saying he always fares well and neutralizes Isner’s serve, but even if he couldn’t, you don’t screw up a 1-1 point by going for the glamorous shot. Isner should’ve served it out at 6-2 but relaxed. Simply a disappointing way to go. He has an arm injury. And then had moment with his ankle? Tablets were anti inflammatories supposedly. He was rubbing his forearm in Basel one match – think it was Sock? Or Kukushkin? And I think he was shaking his ankle against Goffin from what I remember but looked like nothing at the time. And that glamorous shot your talking about is a shot Federer very rarely misses. You do not want to give ground to Isner, and he would not have been able to do anything he wanted with that shot, had he let it bounce, imo. Look, I get it, nothing is guaranteed. But c’mon…I think you or me would love to have a high bouncing shot 4 feet from the net against anyone, Isner included. He got careless and lost the point, which cost him the tiebreak. I only wish he’d have gone out on a better point, that’s all. Had to leave after 1. set, had a bad feeling, and was bored, too. Maybe good with a little vacation for him now, if he’s not well. Still I’m very excited what excitings are in for us in future – his latest 2 matches were so really promising, and I think his greatness is still very clear to watch, even when a small loss must be accepted.